Today, online presence is as significant as your offline identity. Social media, online bank portals, and even blogs require registration. Your email evolved to an actual identification method online. Some of our most sensitive information is stored in our email account; imagine what an imposter would find if they got a hold of your password. The contacts in your address book, your schedule, confidential attachments, and private conversations would all be compromised. Additionally, they may find access to your Facebook, Amazon, and other such accounts. 1) Limit the apps that have access to your personal information. 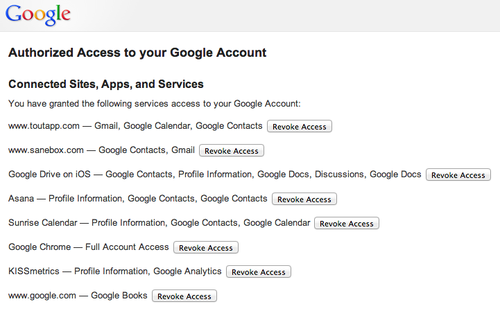 Each time you sign up for an app that requires Google account authorization, you’re providing that app with access to your information. Even if you don’t use the app anymore, the information is still available to them. To see all of the apps that are connected to your Google account, go to https://accounts.google.com/b/0/IssuedAuthSubTokens (prepare yourself, this is quite shocking). This page displays the apps you’ve authorized and what information they’re allowed to see. Revoke access to all of the apps that you no longer use and any suspicious apps that are on the list. In the future, be aware of the apps that make you sign up using your Google account information, sometimes there are better options. This also applies to websites that allow you to sign up using Facebook or Twitter instead of creating an account. If you’re uncertain how safe a website is, install Mywot on your web browser. The Mywot extension will warn you if you’re on an untrustworthy website or exposed to any other online threats. It’s best to change your password every few months. You should never give your password out to anyone and if you really have to give it out, change it as soon as possible. Treat your email as if it’s your safety deposit box. You wouldn’t give the keys to your safety deposit box to just anyone and you should be even more cautious with your email account. Go to https://accounts.google.com/EditPasswdto change your password. a) Don’t use the same password on more than one site, because if someone hacks your account, they will use that password to attempt access to your other accounts. b) Make your password long and don’t use any words you can find in the dictionary or personal information like your street address. If you can easily tell your password to another person, it is not strong enough. 3) Sign up for 2-Step Verification. 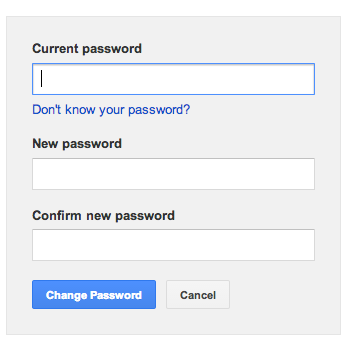 The 2-Step Verification is an additional layer of protection for your Gmail Account. This is especially important if you look at your email on public computers. 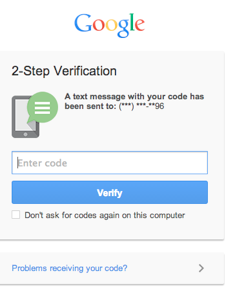 Go to http://www.google.com/landing/2step/ to set up a 2-Step Verification for your Google account. Anytime you sign into your Google account from an unknown computer, Google will ask you to enter a verification code that they send via SMS, Google’s mobile app, or voice call. If it’s a computer you use regularly, there’s a box you can check so Google doesn’t ask you to complete the 2-step verification process again. If anyone accesses your email account overseas – IMMEDIATE RED FLAG. You may think the likelihood of this happening is minuscule, but it’s good to double check. Scroll down to the bottom of your Gmail inbox page and click “details” on the right side of your screen under last account activity. Once you click the link, a window will pop up (see example below). 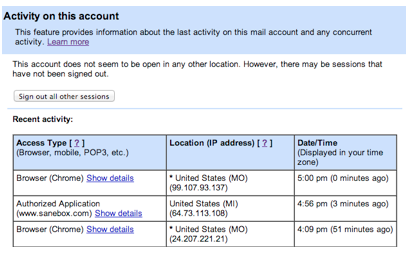 This window shows you the various locations your email is being opened. Make sure there are no unfamiliar places on the list. You should also change your alert preference to say, “Show an alert for unusual activity.” Then scroll to the top and click the ‘sign out all other sessions’ button. 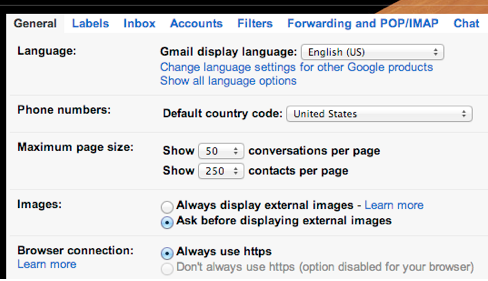 Go to your Gmail inbox page and click the gear icon at the top-right side of the screen. Select “Settings” and click the Accounts tab at the top. a) You want to make sure all the email addresses under the “Send mail as” section are emails you own and use. b) Once you finish that, click the General tab and scroll down to “Browser connection.” Check to see that “Always use https” is selected. The “s” at the end of https means there is an added layer of protection. Make sure you see HTTPS before checking your email at coffee shops and any other public places. c) You should also go to the ‘Forwarding and POP/IMPAC’ tab. Check to see that your email isn’t being forwarded to any unknown email addresses. The convenience of signing in using the Gmail profile in most websites also creates vulnerabilities. Some sites may gain access through session hijacking[Session Hijacking Controls your Account without Password: How to]. It is necessary to check what applications and websites have access to your account. Go to your accounts Sign-in & security page. Scroll down to Apps with account access. Click Manage appsunder Apps with access to your account. You will see that applications with access to your account information. It also includes Android applications on your phone. Review each application and its access. Click on any app, and it will list the services it can access. Remove access to any applications you haven’t use in six months. Only keep trusted and frequently used apps. While your email is typically not local on your machine, it is still essential to keep your computer free of threats. Malware residing in your system may gain access to your login information. Hackers can freely log in to your Gmail once they capture the data. Or worse, gain access to more essential websites and portals. Keep your computer clean by installing antivirus and anti-malware applications. Good examples are Avira and MalwareFox. The security applications will provide real-time protection. Additionally, schedule regular scans to make sure no malicious applications are hiding on your computer. Also, keep everything updated. New patches are regularly available to most modern operating systems. Keep your browser updated as well. The security systems mentioned above should always be up-to-date too.